Pharma Industry Keeps Hand In Health Care Bill One of the groups key to passing health care legislation is the pharmaceutical industry, which has been quite active behind the scenes. Billy Tauzin, president and CEO of PhRMA, the biggest trade association for the prescription drug industry, says health care is a moral imperative. Billy Tauzin, president and CEO of the Pharmaceutical Research and Manufacturers of America, speaks during a news conference in Dallas in 2005. As Congress works on the health care overhaul bills, it continues to do a complicated dance to keep patients in mind while getting health providers on board. One of the groups key to working any deal is the pharmaceutical industry, which has been quite active behind the scenes. NPR's Linda Wertheimer talks with Billy Tauzin, president and CEO of PhRMA, the biggest trade association for the prescription drug industry. "The recession has affected very deeply the pharmaceutical sector of our economy," Tauzin says. "We've shed over 130,000 jobs worldwide, many of them here in this country." And, he says, there also has been a reduction in prices over the past few years because of the increase in generic products in the marketplace. "In fact, we're up to 72 percent generic use in this country — the highest use in the world, so that the patent medicine market is now only 28 percent," Tauzin says. "It's sort of a tough spot for them, but they're working through it." When Congress began planning and drafting health care overhaul bills, PhRMA jumped right into the mix. Why get involved now? Tauzin says his industry agrees with the president that health care is a moral imperative, and it's important that people in this country have good insurance and access to products that can keep them healthy. "We also believe it's an economic imperative now. And the studies we have indicate that if we do nothing now, this country is going to get sicker and poorer and less competitive with the world," he says. Earlier this month, PhRMA negotiated the pharmaceutical industry's contribution to Medicare prescription drug costs in the Senate health care bill. PhRMA agreed to increase the amount pharmaceutical companies will pay to help cover costs not covered by Medicare. The agreed upon $80 billion contribution was a compromise, Tauzin says; the president wanted a higher contribution and the PhRMA wanted less. Tauzin says the drug industry is doing its part supporting health care. Currently, drug costs are 8 percent of all health care spending, but because of high co-pays, people tend to think drug costs are a bigger part of health care costs, Tauzin says. "[People] think it must be medicine's driving the cost of health care. It's not. ... It's not the big pocket of money people think it is." A recent NPR poll shows that approval of the president's health care plan has slipped — slightly more people disapprove than approve now. Still, Tauzin says, health care overhaul can be done. "It will not be what everybody wants. It never is. But it will, I believe, be a huge and substantial step toward covering the Americans who are not covered and changing the course of health care in America toward real prevention and disease management rather than just damage control," he says. "If we can do that, we'll control costs long-term. You will have a healthy America. You will have a more productive America, and you will have literally a wealthier America." 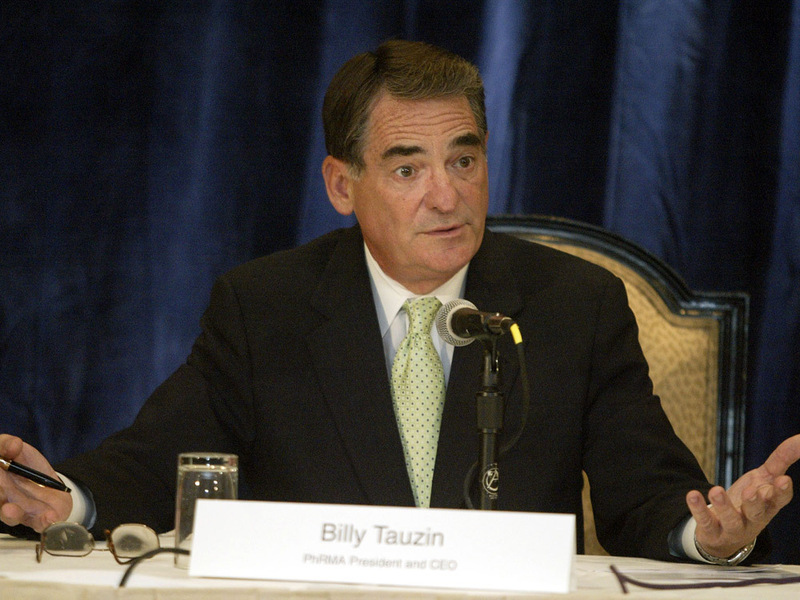 When asked whether that would lead to a wealthier pharmaceutical industry, Tauzin says, "I can't predict that. I can only tell you that we'll do OK."